City of Lufkin historical marker, Angelina County. Image available on the Internet and included in accordance with Title 17 U.S.C. Section 107. LUFKIN, TEXAS. Lufkin, the county seat of Angelina County, is at the intersection of U.S. highways 59 and 69, a few miles northwest of the geographic center of the county in the heart of the Piney Woods of East Texas. It was founded in 1882 as a stop on the Houston, East and West Texas Railway, when the line built from Houston to Shreveport, Louisiana, and named for Capt. Abraham P. Lufkin, a Galveston cotton merchant and city councilman, who was a close friend of HE&WT president Paul Bremond. 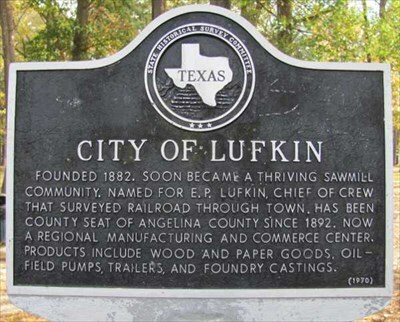 Lufkin grew both because of its proximity to the railroad and because of the extensive lumber industry in the surrounding area. The history of Lufkin may be divided into three principal eras. The first, which centered on the arrival of the railroad and the progress it precipitated, occurred between 1882 and 1890. The second, marked by a timber boom that produced hundreds of sawmills in the Piney Woods, took place between 1890 and 1920. The third, often called the town's "golden era of expansion," occurred between 1938 and 1945, when industrial expansion produced thousands of new jobs and widespread community growth. The settlement was little more than a clearing, also called Denman Springs, when a railroad surveying crew crossed Angelina County in 1881 planning a route for the line. The crew reputedly began its work by surveying a route through Homer, which was then the county seat. According to an old story, they spent a Saturday night carousing at Homer, where they became rowdy in the saloon, and Constable W. B. (Buck) Green put them in jail. The next morning they paid their fines and were released. The arrest, however, infuriated the chief of the survey crew, who reportedly ordered them to find a route for the railroad that would bypass Homer and go by Denman Springs. The new route conveniently crossed the property of Lafayette Denman and his son, Dr. A. M. Denman, who are said to have hosted members of the survey crew a few days earlier. This story of Lufkin's origins may be only a colorful legend, however, for the railway's 1879 prospectus already indicated that the line would bypass Homer and go through the future site of Lufkin. Lufkin Railroad Depot circa 1921. Image courtesy of Harold K. Vollrath. Image available on the Internet and included in accordance with Title 17 U.S.C. Section 107. Soon after the railroad arrived in 1882, the company began to advertise the public sale of town lots in Lufkin. At the same time, many of the business firms and professionals from Homer began to move to Lufkin to be nearer the railroad. Among the first stores in town were S. Abram's general store, Joseph Kerr's grocery and saddle shop, and W. H. Bonner's general store, all located on Cotton Square, which soon became the center of activity for the town. In the square, just behind the depot, cotton was stored before shipment on the railroad. Lufkin acquired a post office in 1882 with William A. Abney as postmaster. In 1883 a telegraph line was strung to Lufkin from Nacogdoches. The town was incorporated on October 15, 1890. On November 15, J. M. Smith, owner of the Smith Hotel, was elected the first mayor. Even before its incorporation, Lufkin had sought to move the county courthouse, still situated at Homer, to the railroad settlement, but by an election in 1885 it stayed at Homer. In November 1891, however, a mysterious fire destroyed the courthouse, and one day later the county commissioners received a petition from Lufkin citizens asking for a new election to decide if the courthouse should be in Lufkin. When the election was held on January 2, 1892, Lufkin won, 1,076–436. Much of the economic prosperity of early Lufkin was tied to three lumbering families: the Kurths, Hendersons, and Wieners. Joseph H. Kurth, Sr., a German immigrant, moved to Keltys, a small settlement north of Lufkin, in 1887 and acquired a sawmill from Charles L. Kelty. Kurth, who had previously operated a mill in Polk County, was soon joined by two friends, S. W. Henderson, Sr., and Sam Wiener, both of Corrigan. In 1890 they organized the Angelina County Lumber Company, which became the forerunner of many innovations in lumber manufacturing and forest management in East Texas. The influence of the three families and their business partners on the growth of Lufkin during the next century was enormous. At the height of their activity, the three families were involved in nearly a dozen Texas sawmills, a paper mill, foundries, hotels, movie theaters, railroads, investment companies, newspapers, radio and television stations, insurance firms, banks, hospitals, and many other enterprises. Two of the city's principal industries, Southland Paper Mills (now St. Regis) and Texas Foundries, were begun as hometown companies in the late 1930s and were responsible for much of the city's industrial growth. The largest industrial employer, Lufkin Foundry and Machine Company (now Lufkin Industries), was also founded as a hometown company in 1902 and achieved worldwide fame for its oilfield pumping units. Lufkin welcome sign. Photo courtesy of Billy Hathorn. Image available on the Internet and included in accordance with Title 17 U.S.C. Section 107. The city's early social and cultural life revolved around its churches, schools, and sports activities. But between 1965 and 1983 Lufkin began to expand culturally. This era resulted in a new library, two new museums, a civic center, a new federal building, a junior college, widespread improvements in the Lufkin Independent School District, a new country club, extensive municipal and park improvements, and two major shopping malls. In 1982 Lufkin celebrated its centennial. The celebration resulted in widespread community improvements, including an extensive beautification effort and the largest exposition center between Dallas and Houston. Though the economy was still linked significantly to the harvesting of timber and the manufacture of lumber, paper, plywood, and other forest products, by 1990 the city had also developed a diversified economic base, including the manufacture of oilfield pumping units, machinery and gears, truck trailers and flooring, foundry products, candy, dairy products, and recreational goods. Lufkin also emerged in the 1970s as a regional trade center and developed a significant tourism and convention economy, largely because of its proximity to Sam Rayburn Reservoir and hunting lands; the Ellen Trout Zoo is also among the local attractions. In 1984 Lufkin had a population estimated at 31,500, of which 25.9 percent were black and 6.3 percent Hispanic, and covered 20.5 square miles. In 1990 the population was 30,206. The population grew to 32,709 by 2000. Angelina County Historical Survey Committee, Land of the Little Angel: A History of Angelina County, Texas, ed. Bob Bowman (Lufkin, Texas, 1976). Bob Bowman, ed., The Lufkin That Was: A Centennial Album (Lufkin, Texas: Lufkin Printing, 1981). Robert S. Maxwell, Whistle in the Piney Woods (Texas Gulf Coast Historical Association Publications Series 7.2, November 1963). Handbook of Texas Online, Bob Bowman, "LUFKIN, TX," accessed April 22, 2019, http://www.tshaonline.org/handbook/online/articles/hdl05.